Allendale, MI – Allendale Charter Township’s population grew by 22.3% between 2010 – 2016 making Allendale the fastest growing community in Ottawa County with an increase of 4,615 residents is just six short years. “The numbers are showing what we’ve known all along, Allendale is a great community to live, work, learn and play,” says Allendale Township Supervisor Adam Elenbaas. Allendale’s growth outpaced the next fastest growing community in Ottawa County, Jamestown Township, by 8.3%. Updated population estimates for local units of government will be available in May, however current projections do not show any signs of growth slowing down. Allendale is expected to grow by 98.2% in the next 15 years. “Having lived in Allendale for over twenty years, I’ve witnessed tremendous growth in both the residential and business sectors. The Allendale Chamber is at the forefront of business and community development and a great example of how we can make Allendale a desired place to live, work and establish a business when we work together. 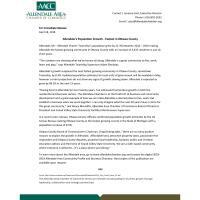 I can only imagine what the next 20 years have in store for this great community,” said Rence Meredith, Allendale Area Chamber of Commerce Board of Directors President and Grand Valley State University Facilities Maintenance Supervisor. In a recent press release, Ottawa County officials confirmed population growth estimates by the US Census Bureau naming Ottawa County as the fastest growing county in the State of Michigan with a population increase of 8.5%. To learn more about the Allendale area, go to www.allendalechamber.org and browse the digital 2018-2019 Allendale Area Community Profile and Business Directory. Hard copies of the publication are available upon request.